Despite the many humanitarian battles of nowadays, we have good reason to say that we do not care about each other. No matter the faces, the scars, the form of the eyes, we do not want to show ourselves as we really are. To connect with others in the everyday life, we prefer to use a secure and protecting cover, a bit like this: “https://” (Secure Hypertext Transfer Protocol). May we name this a wish for anonymity? What would be the reaction of the passengers of a city, if they met every day somebody literally covered up, dressed in a second skin? Would they join the Different? What if He is the only one not having fun? Above the Skin is an artistic and urban action that move from this need: to meet in the urban space, to show ourselves naked and covered at the same time (to say it with an oxymoron) by a second skin. DAY 2 “Can I change skin like an animal? What happens to the old skin if I get a new one? DAY 9 “Before and after: how many masks are we forced to put on every day? In Hungary, suddenly one of Europe’s most anti-immigration nations with its planned border fence, it was hard to say at that time. Public opinion swung against the refugees in short time, when thousands of asylum seekers had entered Hungary. A poll in April 2015 showed that almost half of Hungarians classified themselves as anti-immigrant. The surge of xenophobia was boosted also by an explicit anti-immigration campaign from the government, displaying billboard messages in Hungarian which stirred up discriminative attitude. They featured slogans commanding to respect Hungarian culture and laws, and warning that “if you come to Hungary, you should not take Hungarians’ jobs”. 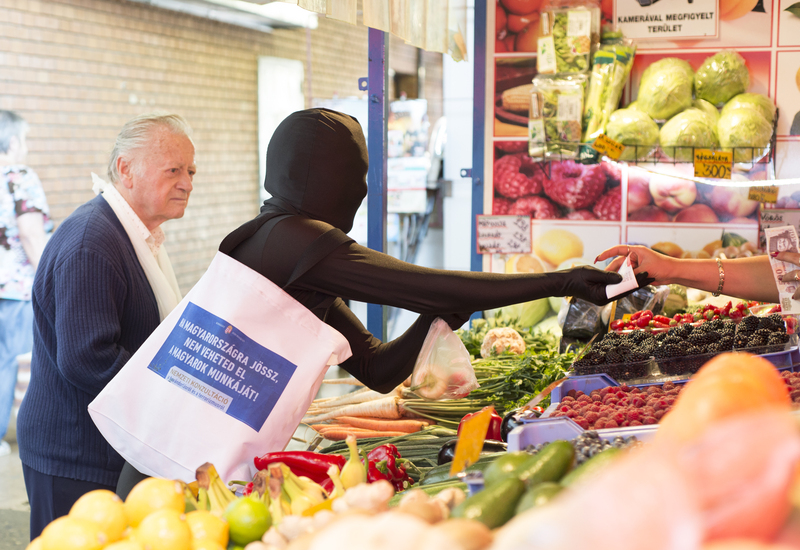 Coming back to Budapest after the two months residency in Paris, this was the welcome… I therefore decided, as artist, to react by wrapping myself into a new black skin, as an immigrant. We may name this as an “act of civil disobedience” or better as an invitation to reflect on the otherness, more than ever so urgent in this country, as in all of the rest of Europe. The project is composed by a Workshop, Urban action & Performance with local participants. Before the conclusive performance, the group will produce several urban actions, walking through the streets of the city, interfering with the social routine and calling the attention of passengers.“The Master of Ceremony is sitting at a long table, prepared with a special dinner for selected guests, locals and foreigners, those latters completely covered by second skin. In an unexpected moment, among them one turns to be an intruder: the one who is unalike even between the Different ones, who, under a second skin, will reveal a “third” one. What will happen instead to the cover-up of the others?